but this time, I'm going to attempt the math. For the most part, I've got two squares facing the sun. The first box is the 15" x 15" glass front, which is parallel to the sun, and therefore extremely effective for catching the watts (metric units) or Btus (English units) being put out by the sun. 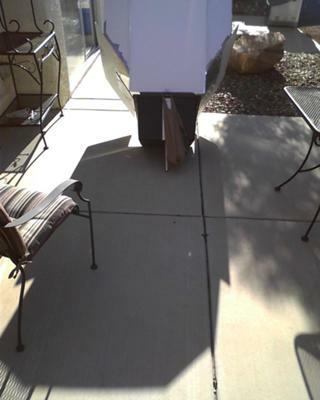 The second box is the 44" x 40" outside square of the reflective panels, after adding the insert, which are at a 45-degree angle to the sun. That's 1760 sq. inches of "catch area". The GSO comes with 4 reflectors which provide 22" x 16" each, or 1408 sq. inches of reflector area. The box they form, for catching parallel sun rays, as I measure it, is 32" x 31" or 992 sq. inches. By placing the reflective insert in place, I've added (1760 x 992) 768 sq. inches of sun catching potential. This means that the oven originally could catch 992 sq. in. or 6.89 sq ft or 0.64 sq meters of sun, which is equal to 2184 BTU or 640 Watts, if 100% efficient, which it isn't. After the insert, the oven now catches 1760 sq. in. or 12.22 sq. ft. or 1.135 sq meters of sun, which is equal to 3874 BTU or 1135 Watts, if 100% efficient. Note: A BTU is the energy required to raise a pound of water, one degree Fahrenheit. A square meter above the Earth's atmosphere receives 1350W of solar energy, which is 4606 BTU (since 1,000 W = 3412 BTU). A square meter on the surface of the Earth, on a clear day collects 1000W of solar energy, or 3412 BTU. A square foot on the surface of the Earth will collect 3412 x 0.093 (rounded conversion factor for sq.feet to sq.meters) = 317 BTU. At this stage of the calculations, we can argue about the efficiency of the glass-fronted black box facing the sun, and say that the 15" x 15" area (225 sq. inches) provides 1.5625 sq. ft or 0.145 sq. meters, to absorb 145 watts or 495 BTUs. If we say that box is 80% efficient, we?ll get 116 watts or 396 BTUs of sun energy. Then we can take our original GSO footprint of 992 sq inches, subtract the 225 sq. inches of the glass-fronted box, and get 767 sq inches of reflective area, which may be 50% effective in reflecting sun energy to the box. This would add 247 watts or 844 btus to the cooker to give us a final total for the original design, of 363.5 watts or 1240 btus. Since the average oven is 500 watts, these numbers seem to be in the ballpark for what you need to cook food at 300F, using the Global Sun Oven. The reflective insert I used, to boost the oven's temperature well above 420F, doubled the reflective area. In so doing, assuming the reflective efficiency is the same as the GSO's reflective panels, we are adding another 247 watts or 844 btu to the oven's potential. The final modified -potential of the oven is now 611 watts or 2086 btus, which is why we can get the oven to well over 400F on a clear day, in cold weather. Okay, football is starting, no more math. In the pictures, I'm using my insert, with a very low angled sun. I put a clip with stone-filled plastic bag at the back to counter-lever the weight, to prevent tipping. Your mind is always running on overdrive, is it not? Always intrigued by the "what if" with regards to solar cooking. I was reviewing this post, and noticed that I had made a math error. BTUs do not convert directly to watts because BTUs measure energy and watts measure power. However, BTUs per hour can be converted to watts, and that conversion factor is: Watt/square meter = 0.317 BTU/ft2-hour. I don't think it affects any calculations in this post, but in case a student is using this as a reference, I wanted it to be right. 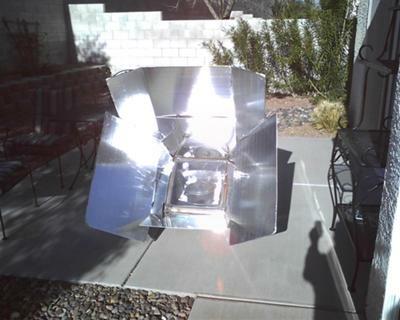 This is the link for the solar oven spreadsheet posted by the University of Arizona. May give you some ideas, if you're attempting to develop your own. I've gone to 450F before, in the summer time in Vegas WITHOUT MY INSERT, so I'm sure I could reach 500F...but I think that may go a bit too far. If I needed that cooking temperature, I'd just pull out the parabolic dish and set a pressure cooker in the holder. It would be there in no time. I agree with your thinking. Don't bother worrying about insulation ratings of your oven, simply perform simple tests and adjust. Graph your results and fine tune. The insulation of an air pocket in a poly carbonate bag, or the air surrounding an inverted glass bowl, may be all you need. A great reflector and large solar "catch area", with proper angles, more than makes up for lack of finished looking materials. 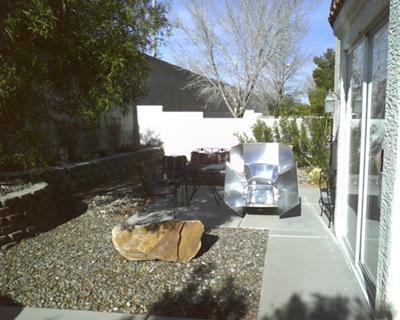 There are so many great designs for solar cookers now on the Internet, that it amazes me that countries with high fuel costs, and sunny days, bother to cook any other way. Thanks for your contribution and math for reflective inserts. You can vary the area of reflective inserts by covering part of the inserts with a cardboard sheet and then measure the maximum temperature attained in GSO. Then you may plot a graph of max temperature [y axis] versus reflective area [x axis]. This graph could be useful for all solar oven designers like us. What could be the max feasible temperature ,given the limitations of the materials used in GSO? Best wishes!